A must have stylish neoprene protective laptop sleeve case for 11.6 inch MacBook Air and other 11 inch laptops. Water Resistant with neoprene bubble protective shock absorbing foam interior. External pocket for carrying accessories such as charger, mouse, data cables, and memory cards. Soft and durable neoprene bubble padded interior cushion protects your device from bumps, scratches, and dents, Dual zipper opening allows for quick and easy access to your laptop. Compact design allows for storage in a backpack or messenger bag. 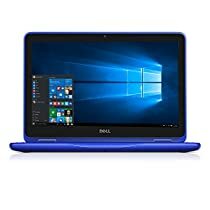 I bought this case because its dimensions appeared to be the right size for the Dell Latitude E7240 and it wasn't terribly expensive. It turned out to fit perfectly: not too snug, and not too loose. Besides that, it's very well padded (holds its form even without the computer in it), and is not at all flimsy. There are a few "cons" I can think of; the following is pretty much an exhaustive list. Cases I've used in the past have had handles, which I miss a little bit. Also, while the computer is thin, this case is a little thick—it almost doubles the thickness of the laptop. On the other hand, it's quite well padded, and fits well in my backpack, so it's really only an æsthetic concern (and barely that, given that the case looks really nice otherwise). Lastly, the zipper can be slightly annoying—if you pull from not quite the right angle it can feel like it's stuck; however, it seems to be happening less and less as I use it: either I'm getting used to it or it's getting "worked in". This is a really nice case and I'm quite happy with it. All the annoyances I listed above are minor enough that I still feel comfortable giving it 5 stars. I am very happy with the case on the link even though it is about an inch too tall at the top. I feel more protected with that case as it has a more firm build. I also like some of the other additions about it like the small zipper for charging the laptop and the fleece on the inside. The zippers also glide very easy. Neither laptop case had a very noticeable smell but that may because I cannot smell to well due to allergy season. The picture is the evecase in comparison the the laptop case mentioned in the link above. I don't think I would consider buying this laptop case again, even if I got a smaller laptop because it isn't the BEST quality nor aesthetically appealing. Although I have only owned this sleeve for about 3 weeks now, I am very satisfied with my investment so far. The build quality has already offered great stability, flexibility and durability. -This sleeve is definitely right-sized for my 11.6” ASUS C202 Chromebook. It fits snugly without much extra space to jostle around too much. -There is also enough space between my Chromebook and the zipper. I was concerned that opening/closing the zipper could scratch my Chromebook if the fit was too tight. -The decision to enclose the sleeve with dual zippers adds an extra layer of stability - especially if one of the zippers becomes stubborn with wear and tear usage. Both zippers glide very easily and securely on the track as well. -The neoprene bubble padding inside provides sufficient impact resistance for me. I do not require a hard-shelled sleeve - I do not travel with my Chromebook in less-than-kind conditions (hiking, cycling). -While housed in the sleeve, I slide my Chromebook in an external pouch of my laptop bag. I noticed already that when I have stowed/dropped my bag, the sleeve has mitigated some expectant bumps/scratches. I did not purchase a sleeve for my previous Chromebook and the bumps/scratches were evident. -Although neoprene is often found on a diver's wetsuit, I do not plan on completing a submersion test. -However, I store food and water in my bag. So I have that peace-of-mind that this sleeve should offer some level of water resistance. -Furthermore, neoprene provides excellent insulation. As a Canadian, my Chromebook should feel protected against the cold weather. 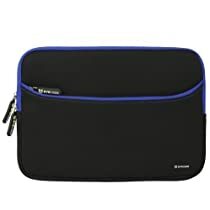 -Barring a few other discretionary reasons, I did not opt for the AmazonBasics Laptop Sleeve because of the absence of a secondary pocket. -The zippered pocket adequately fits all my peripherals (mouse, power cables, memory cards, headphones, HDMI cable). -A sleeve with a handle could be practical if I decide to travel sans-laptop bag. -However, I felt a handle would uncomfortably lengthen the dimensions of the sleeve, preventing it from sliding so effortlessly in my pouch. So my overall goal when buying a sleeve were those considerations and not to embellish aesthetically. I felt that when it comes to a sleeve, style should not always come at the cost of protection from bumps/scratches. Perhaps I could embroider some Marvel Comic/TMNT artwork if I start to feel ambitiously decorative.